August | 2010 | Eugene is huge! A lot of times, there are cases where Japanese or Korean artists try to make it in the other country, and make the dire mistake of simply taking a song in its original language and simply translating or writing new lyrics in the other language. Usually this doesn’t work… at all. Girl’s Generation is the latest to take their music to Japan and have released their song Genie in Japanese. SNSD, well actually I guess if we are going by their Japanese name, it’s SJJD, wants to take Japan by storm. But I don’t really see it. I could be wrong, after all DBSK (also known as TVXQ and THSK) were extremely successful in Japan. The difference is that most of Tohoshinki’s music was not mere reproductions of their Korean library. They were original songs. Wait, SNSD, SJJD, DBSK, TVXQ, THSK? Yes yes, let me explain. Dong Bang Shin Ki (동방신기 Rising Gods of the East?) is abbreviated as DBSK. They are also popular in China, where they are called 東方神起 (Tong Vfang Xien Qi), and in Japan, where they are called 東方神起 (Tohoshinki). Hence, DBSK is the abbreviation of their Korean name. TVXQ of their Chinese name. THSK is something I made up 30 seconds ago, because in Japanese it’s never common to abbreviate anything with acronymns. Usually they would take the first and third characters and but them together, so 東神　(TOSHIN) would be how that works. I don’t live in Japan, so I am not sure if they even bother to abbreviate it. Girls’ Generation is known as 소녀시대 (Seonyeo Shidae) in Korean. English speakers have abbreviated this to SNSD, which the group itself was surprised to learn when they went international. In Japanese, the name would be 少女時代　(Shoujo Jidai). Screen Golf! Golfzon leads the way. It seems like Koreans really really like golf. I’ve already done two articles on Y.E. Yang, and I’ve also written about chopsticks, and how some believe that Korean use of metal chopsticks is responsible for the success of Korean golfers (though I myself don’t believe that.) So, in a golf crazy nation such as this one, (to put it in perspective, on cable there are three golf channels, one more than Starcraft), it’s only natural that Korea would lead in the area of golf simulation. I’ve seen golf simulators before in the U.S., but had never played them. I guess the idea is that you hit a ball past some sensors which calculate the angle, speed, and trajectory of the ball. This translates onto the screen and shows where your ball landed. Golfzon‘s simulator takes that to the next level with a high definition screen, a tilting plate that matches the terrain where the ball stands, and it also calculates the spin on the ball. It’s like actually being on the golf course, only it’s probably not as hot (or cold) as the real golf course, and you don’t need to walk as much. 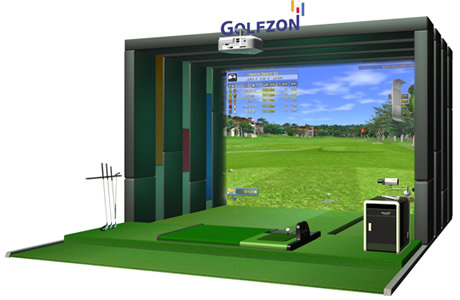 You can also play on actual golf courses using the Golfzon simulator. To check it out in more detail, click here! I think in the future we will see this technology go 3D, and then after that holograms. Much much later in the future I bet there will be golf VR like on the Star Trek holodeck, but maybe I am getting too far ahead of myself. Romanson Watches. A Korean made luxury. A Korean watch that's Swiss made. In an earlier article about chopsticks, I berated a commenter on her idea about Koreans having exceptional skill in precision based industries because of Korean use of metal chopsticks. One example I used was to point out that the Swiss don’t use chopsticks and lead the world in clock and watch making. “Where are the Korean watchmakers?” I asked? Well it turns out, I was wrong. There is a major Korean watchmaker, Romanson. It appears Romanson has mastered an exact kind of advanced technology in watchmaking. This includes a watch with a “cuting glass watch with a surface that has been carved in a diamond shape,” according to Romanson’s website. The company was founded in 1988, and began manufacturing watches with Swiss movement in the 1990’s. Most of Romanson’s watches are manufactured in Korea with Swiss movement, except the Premier class, which is manufactured in Switzerland. Here’s some more info about the company and its products from someone else’s blog. Among the more notable accomplishments of the company include designing a unification watch for Korea’s leaders, and designing a watch for specific use by Ban Ki-moon, the UN Secretary General. The last watch that I actually used was a Timex Indiglo that cost less thta $50, because I’ve never been into luxury items. I think that even if I was stupid rich, I’d still live frugally, because I don’t believe in showing off my wealth to everyone on my wrist, in my clothing, or with the car I drive. But that’s just me. Recently I don’t wear a watch because I look at my cellular phone to find what time it is. As far as the chopsticks = dexterity debate goes, I’m not changing my mind. I don’t see any correlation between metal chopstick use and precision based activities, but the idea is quite popular both in and outside of Korea. Chinatown? Oh really? Why isn't the sign in Chinese? In almost every major city the world over (or at least near it), there is a Chinatown. Chinatowns usually have gigantic Chinese style ornamental gates, and all of the businesses inside it are owned and run by Chinese. Some cities I’ve been to with great Chinatowns are New York, Boston, and Shanghai. (Okay I know, Shanghai is actually in China, but how much more authentic can you get than that?) There are of course other cities which had a Chinatown, but most of the Chinese people moved away, making the name of the town anachronistic. Washington DC’s Chinatown at this point is nothing of the sort. Sure it has a big Chinese gate and a smattering of Chinese restaurants, but the MCI Center (or whatever it’s called now) is also there, and most of the people who live and work there aren’t Chinese. Most of DC’s Chinese people have moved to the suburbs, specifically Rockville, MD, I think a few streets of Rockville should be classified as Chinatown. Seoul itself used to have a thriving Chinese community in the area next to Yonsei University, Yonhee-dong. There’s still a school for overseas Chinese there and lots of Korean style Chinese restaurants, but these are largely remnants of a time long past. Everyone in Seoul knows that the real Chinatown is in Inchon now. My trip to Busan earlier this month wasn’t my first, so this information about Busan’s Chinatown isn’t anything new that I discovered, but I thought it would be interesting to my readers. 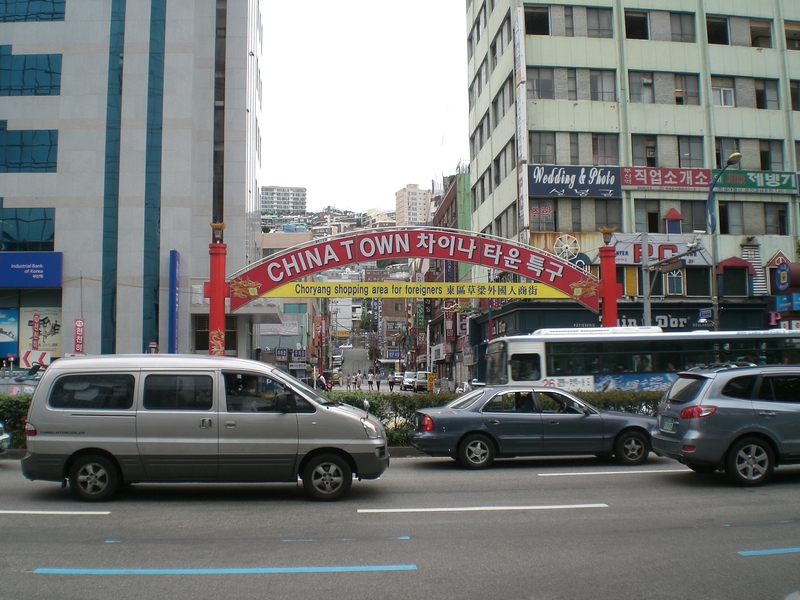 Chinatown is located across the street from the Busan Train Station. It has a huge gate showing that it is Chinatown. Click the picture and look. 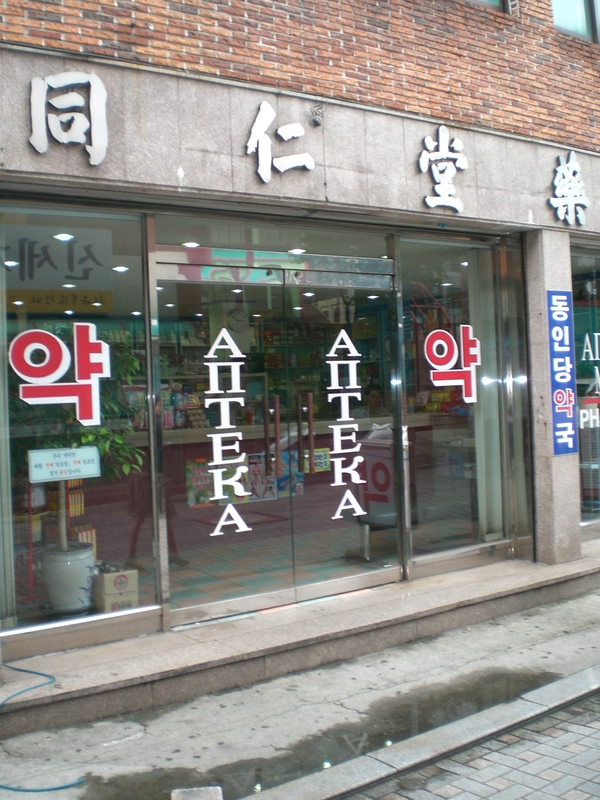 A pharmacy in Chinatown. I don't read Russian, so I don't know what that says, but I'm pretty sure the Chinese at the top doesn't say anything about medicine. 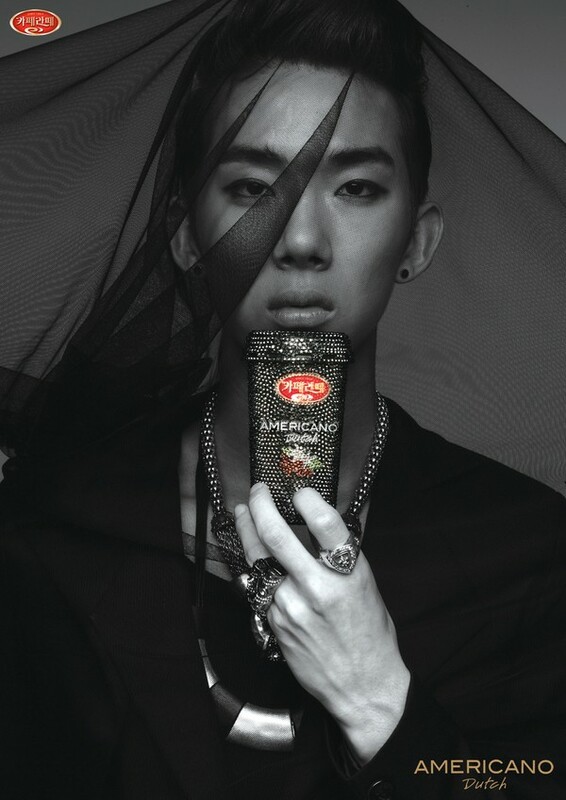 I like 2AM and its leader Jo Kwon, but sometimes I don’t really understand Korean advertising. Well, I guess I’m talking about this ad and giving it free press, which is exactly what they wanted, but I can’t imagine what the ad executives were thinking with this one, especially when the model is known for acting flamboyant and happy all the time. White and fluffy, sticky rice is the staple of every meal. 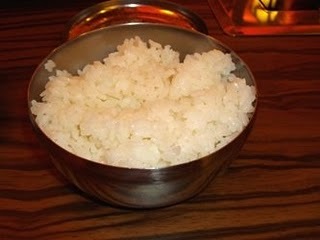 Without a doubt, rice is an important part of almost every Korean meal. There are a lot of requests I get asking people to teach them to cook Korean food. I’m a man, and I was raised in the U.S., so my skills in cooking authentic Korean food are dubious, however, if there’s one thing that I know how to do properly, it’s how to cook rice. But rice isn’t that hard to make! Au contraire! It is difficult. You have to get exactly the right ratio of water to rice, and it has to be cooked in exactly the right way. Otherwise it’s ruined. I’ve had rice prepared by people who don’t care about the particulars, and it’s not good. Trust me. I remember one time in college, some guy I was friends with had the audacity to just put the rice in a pot and boil it, without thinking about how much water he was actually putting in there. The result was a slurry of rice paste. I’m sorry, but I like to EAT rice, not drink it. Okay, I’m not much of a figure skating fan. The only time I ever got into it was whenever there was a controversy (such as the Nancy Kerrigan and Tonya Harding event in which Tonya hired someone to beat Nancy’s legs to solidify her place on the US figure skating team, even though both skaters ultimately made it) or when I discovered Kim Yuna. Okay, well discover is the wrong word for it. Korea is in love with its sports heroes, and often digs deep to find heroes with even partial Korean ancestry who haven’t lived for a significant amount of time in Korea. Around late 2009 I was bombarded on all ends by everyone telling me about how awesome Yuna Kim is. I didn’t really pay much attention to it at first because I really don’t care about figure skating, but one day I happened to be flipping through the channels and I saw her on TV. WOW. She was amazing. Everything she did looked flawless. In the 2010 Winter Olympics in Vancouver, Canada, there was so much hype about Kim vs. Asada Mao, Japan’s best figure skater. It was pretty much a given that one would get gold, and one would get silver. So here we have quite possibly the greatest figure skater in the last 20 years (if not ever) and some good old fashioned Korea-Japan rivalry. Needless to say I was eagerly watching. Kim eventually won the gold and Koreans everywhere puffed their chests and smiled. One thing that was also interesting was that her coach, Brian Orser, had also been a figure skater, and was also in a heated Canada/US rivalry with American Brian Boitano. Many to this day say Orser was the better skater, but at the olympics in which they competed with each other, Boitano was better. Koreans all seemed to really like Orser for all he had done with Yuna to help her get the gold. He and Yuna came to Korea right after Vancouver to heroes’ welcomes. Not since Guus Hiddink had a person of foreign origin involved in Korea’s sports been so highly regarded.